The aim of Mine & Blade: Commander Mod is to provide the player with controllable npcs that will help you fight enemies. 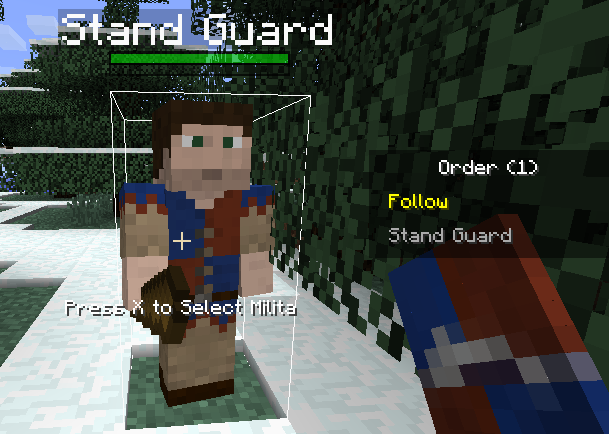 There are a number of mods that provide npcs, however this mod will focus on soldier type npcs. The other thing thatwill set this mod apart from other similar mods is the ability for units to gain experience and upgrade to more powerful units as well as the great deal of customisationof the visual appearance of the soldiers. Units are spawned from a spawn banner. 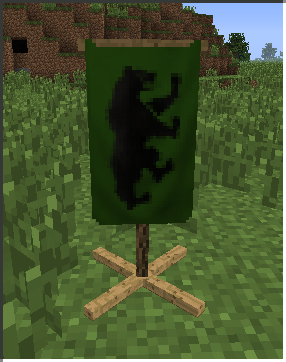 Banners are created by placing 2 pieces of the same coloured wool on top of a stick. A banner must be placed on top of a block that has 2 free spaces above it (the banner takes up 2 blocks like a door). Right clicking the banner brings up the spawning interface. The Militia is little more than a peasant who has been thrust into the middle of a battle. They are armed with whatever they find lying around and their clothing offers little in the way of protection. The Knight is provided with the best iron based weapons, armour and shields. Their heavy armour and shields make them the most durable warriors in the land. Armed with 2 of the best iron based weapons in the land, The Sellsword are easily able to take down more heavily armed foes. This however does come at the expense of their armor, which is less heavy then other units. Although the Spearman’s weapons may be slightly unwieldy, they more than make up for it in the extended range their iron weapons provide. Coupled with their chain based armour this makes the Spearman a formidable force. He extended range provided by the Pikeman’s iron weapons allows them to attack enemy safely from a short range. Even those enemies that do get past their jabs must face a heavily armoured foe. The current command will be shown in the display text above the soldier. The health bar is displayed just below this, it will change colour from green to red dependingon the current health. Below the health bar is the experience bar. Units will gain experience for every hit they preform against an enemy mob. The experience bar changesfrom purple to light blue. After units have not seen an enemy for 15 seconds, they will sheath their weapon. At this point the unit will begin to slowly heal itself. Soldiers will also drink any potion you hand them. Units will automatically break whatever it is they are doing if they see a mob (within 16 blocks) to attack the mob. 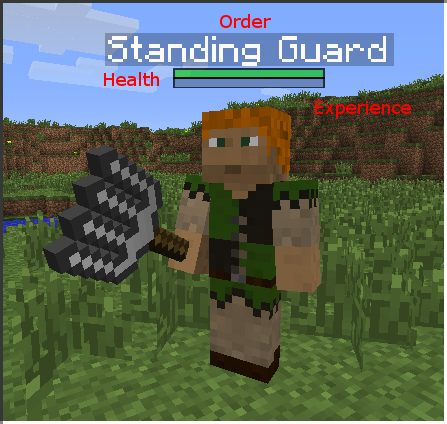 Mobs will also walk towards and attack units. Mob do not currently attack exploding mobs (eg creepers) as this would be akin to suicide. Likewise units do not currently attack units on different teams. 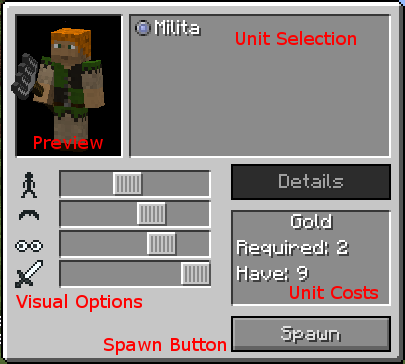 Pointing at a soldier from less than 5 blocks away and pressing the ‘X’ button will select the soldier. Multiple soldiers can be selected. *Any colour wool can be used. The stand guard command is the default command for units. In this command the unit will stand in place. They will only move if an enemy mob is seen, after the enemy hasbeen dealt with, the unit will return to its position. The follow command allows you to set units to follow the commanding player. Units will continue to follow the player (unless an enemy is sighted) until told to doanother order. Mine & Blade units prefom better when they are well fed and surrounded by teammates. The current morale of a unit can be viewed by the colour of the order. Making a killing blow on a mob. Make sure you follow all the installation instructions for Forge.